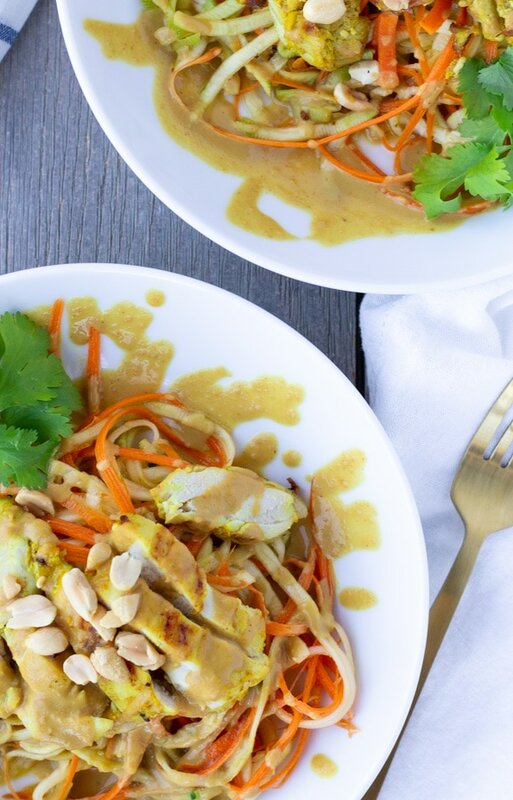 Vibrant flavors of Coconut, Turmeric, and a creamy peanut sauce amplify this healthy bowl of Thai Chicken Satay and Zoodles. I love eating Thai Chicken Satay, and in Thailand we ate this almost everyday since it’s a widely popular street food. You really can’t go wrong with meat on a stick. I used the same marinade and recipe as my Thai Chicken Satay, but did not skewer the chicken. This saved some time and I was able to cook the chicken thighs whole and slice them up afterwards. While I love eating noodles, I also enjoy swapping them out for spiralized veggie noodles for a low carb meal. It’s even more convenient with stores selling pre spiralized veggies either fresh or frozen. This is great to save more time or if you haven’t invested in a spiralizer, which I highly recommend getting if you enjoy zoodles. If you’re trying to eat healthier and cook more, then take advantage of store shortcuts, buy pre-cut veggies or zoodles, while they do cost a bit more, you get the convenience of saving time and eating healthier. 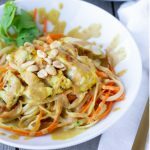 The part that puts this Chicken Satay Zoodle bowl over the top, is a creamy dreamy peanut sauce. I will say this sauce is not low in calories and fat, because both coconut milk and peanut butter are high in fat. But a little of this sauce goes a long way and it definitely brings the dish together. 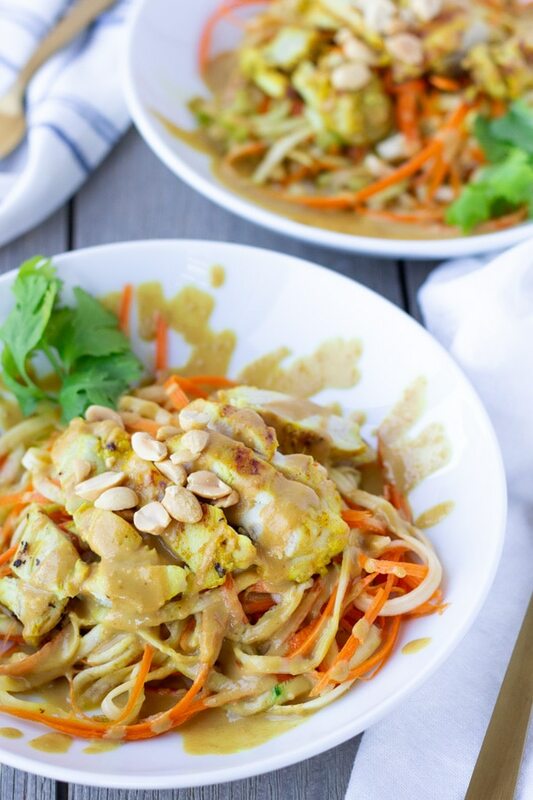 You’re already cutting calories by using zoodles instead of rice noodles, so the peanut sauce balances it out. Don’t feel intimidated by the ingredient list. 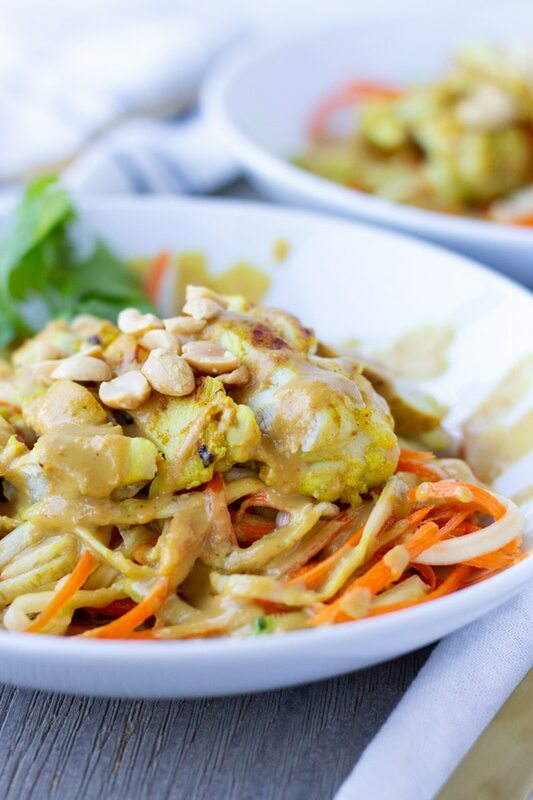 While it looks long, most of the same ingredients are used in the Chicken marinade and in the peanut sauce. I made this dish the other night when I was in a hurry and had it ready in less than 30 minutes. The chicken had been marinating since the morning, but you can definitely have it marinate overnight. Mix all ingredients for marinade into a medium bowl, whisk well and add chicken. Allow to marinate for 30 minutes, or longer. Can marinate overnight. Remove chicken from marinade, and cook over a grill or large saute pan until fully cooked. Use a spiralizer for the zucchini and carrots, Once chicken is cooked, use the same pan and add veggies, cook for a minute or 2 until warmed. Place all ingredients for peanut sauce into a small sauce pan, bring heat to simmer, whisk until it becomes smooth and creamy. 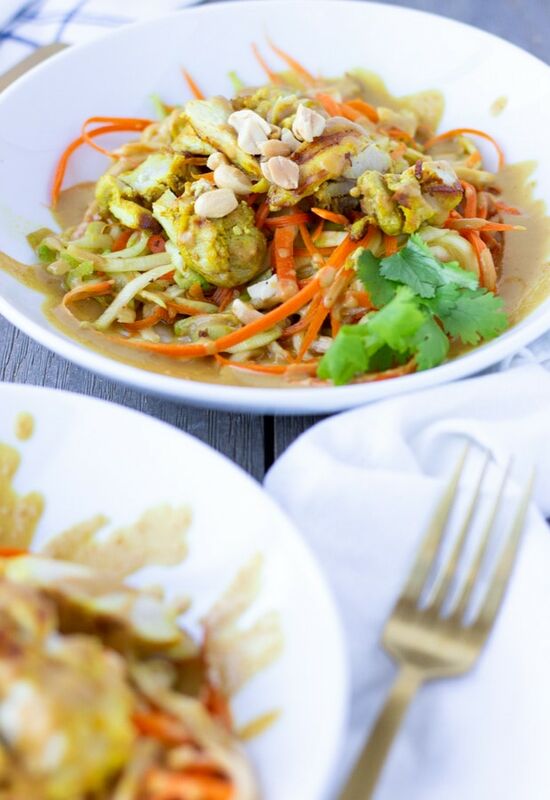 Plate zoodles then top with sliced chicken satay, and smother with peanut sauce. Garnish with cilantro and extra peanuts.